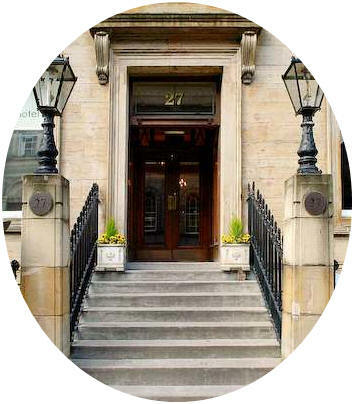 Johnny Bannerman wrote Mairi's Wedding (aka "Marie's Wedding" and the "Lewis Bridal Song") for Mary McNiven using a traditional Scots tune, and it was first played for her at the Old Highlanders Institute in Glasgow's 27 Elmbank Street in 1935 (above). "I still have a clear recollection of that day," said Mary. "Johnny just said the song was for me." Now the City Hotel, only the word Failte carved above the doorway remind visitors of its former function. It was translated into English a year later, by Sir Hugh Robertson. Although Mary herself was real, the wedding wasn't. For she didn't get hitched to Skye-born sea captain John Campbell until six years later. The bride lived into her nineties and is reported as being amazed by the song's popularity.